Turf Hacker: Is Feast or Famine Better than Light and Frequent? Is Feast or Famine Better than Light and Frequent? This past week I gave my greens a reasonably heavy fertilizer application (1g n/m^2 (0.25# N/1000) as all the signs I had were suggesting that my greens needed more fertilizer. 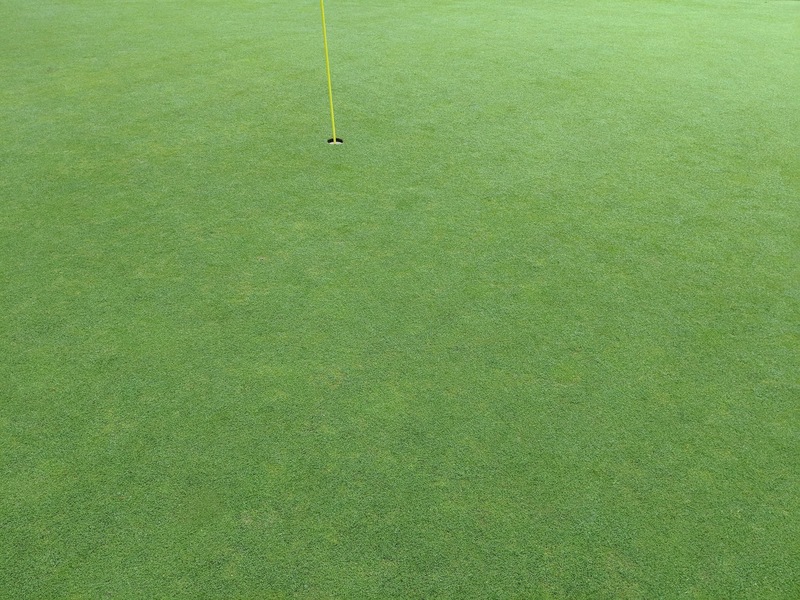 The poa was thin and weak from just coming out of the seed head flush and was covered in anthracnose. 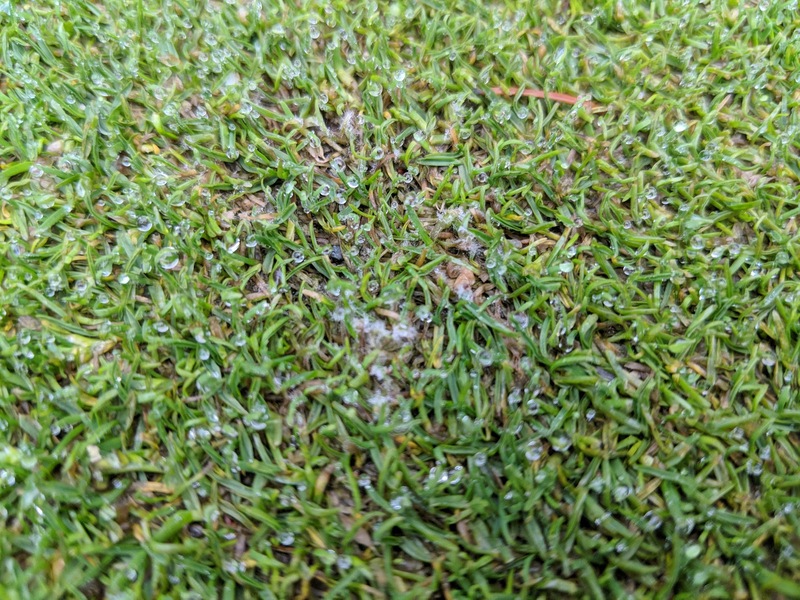 I took this opportunity to spread some bentgrass seed as the competition in the next few weeks from the poa will not be very high and this is ideal for seedling establishment. Not surprisingly, 2 days following the fertilizer application our growth rate skyrocketed and it appears that the anthracnose destruction has slowed which is what I wanted. I want thin, weak poa and the anthracnose is one of the best selective tools (available in Canada eh) I can think of to do that. A few days following the fertilizer app they are looking much better despite still being covered in disease. F yeah! While out changing pins today I noticed that the diseased poa was still relatively stunted and slow growing but the bentgrass was surging with growth. I thought that maybe this could be a better way to promote bentgrass over poa annua. Instead of light and frequent feeding we could restrict fertilizer until the poa starts to show signs of stress and disease, throw down some seed, then hit them with a relatively high dose of fertilizer with the hope that the stressed poa cannot take advantage of the increased nitrogen rates as the bentgrass can. We can combine this with measuring the clipping yield and estimating the amount of nutrient removed from clipping removal and adjust our fertilizer rates throughout the year to account of nutrient release from organic matter. This way we can apply relatively high fertilizer rates at some times of the year but also burn organic matter at other times of the year. While I love the idea of simply applying very little fertilizer like some successful bentgrass growers do. I also think that it might not just be about applying less, but applying the right amount at the right time especially when we take plant health and the desire to use less pesticides into account. From what I have seen and learned over the past few years, we can probably significantly reduce our need for corrective pesticides if we can simply (not that simple) grow the grass at the appropriate speed for the time of year. 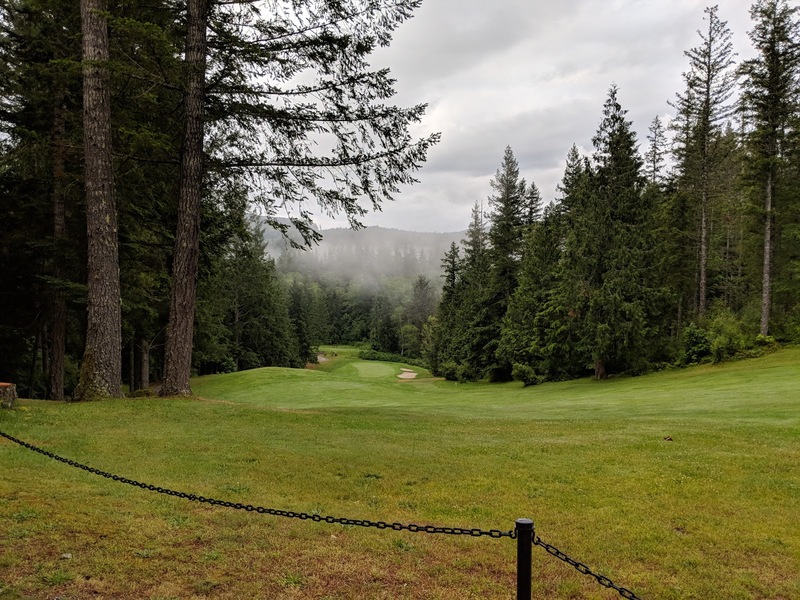 My observations about disease and growth rate were reaffirmed this last week when the increased nitrogen rates resulted in an outbreak of fusarium. This was fully expected but also not a worry because the weather next week will be too hot and dry for fusarium to last long. 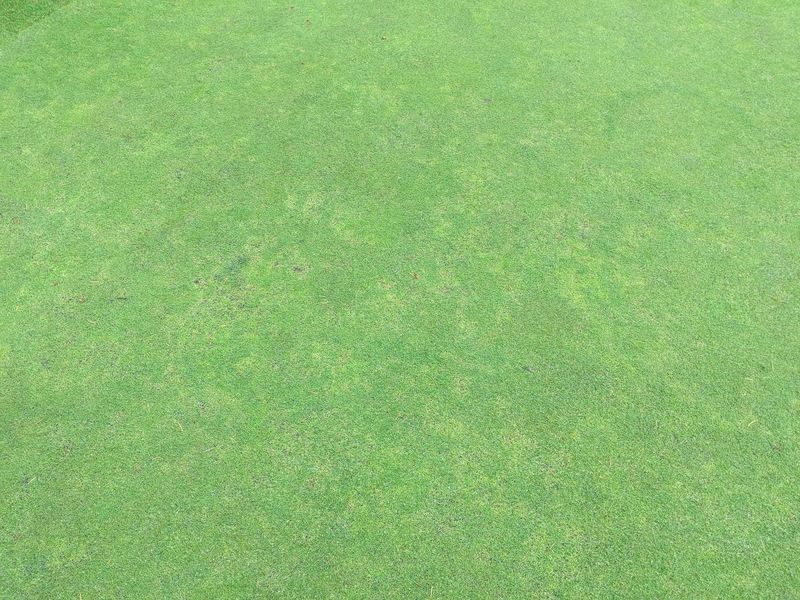 The fusarium is also only present on the poa so any more selective poa death right now is welcome. 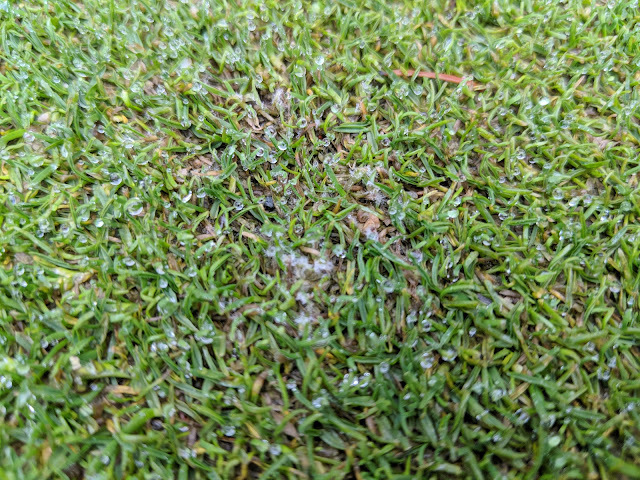 It's also worth noting that disease has been so low on my greens that I have dropped phosphite from my disease management program. I have required a fungicide every spring but this year (and last) I made it through without despite applying less and less pest control products. Maybe it's the weather because we had one of the hottest and driest Mays on record. small patches of fusarium mycelium were visible this morning on the poa. GOOD! So I think the plan now for fertilizing greens will be to monitor growth rates and poa health and hold off on fertilizer applications long enough to stress the poa and then follow it with a healthy dose of nitrogen to fill in the voids hopefully with bentgrass. Ever since changing the rates and timing of nitrogen on my course (thanks to the growth potential formula) I have made huge gains in bentgrass on our greens. 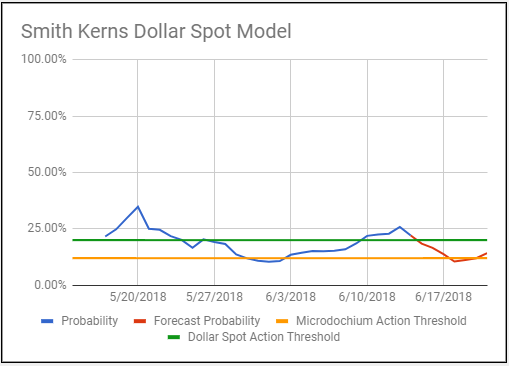 I wonder if taking this a step further by deliberately stressing the poa during the high growth months while also providing the bentgrass with enough nitrogen to remain competitive will be a viable strategy. There is a lot of talk about how if you want to promote bentgrass over poa you need to use less nitrogen which I think it partially true but like all generalizations I think this idea can be improved upon. While less nitrogen is probably key, bentgrass isn't going to grow quickly enough to fill in the voids if we are trying to convert from poa to bent. Maybe if we can do a bit of both with this approach we will be able to get the advantages of both low fertilizer and high fertilizer rates to achieve our goals of having more bentgrass? There's only one way to find out I guess. This is, of course, subject to constant change.